I spotted this Zebra dove in my front yard feeding om tall weed just before I started to mow my lawn. 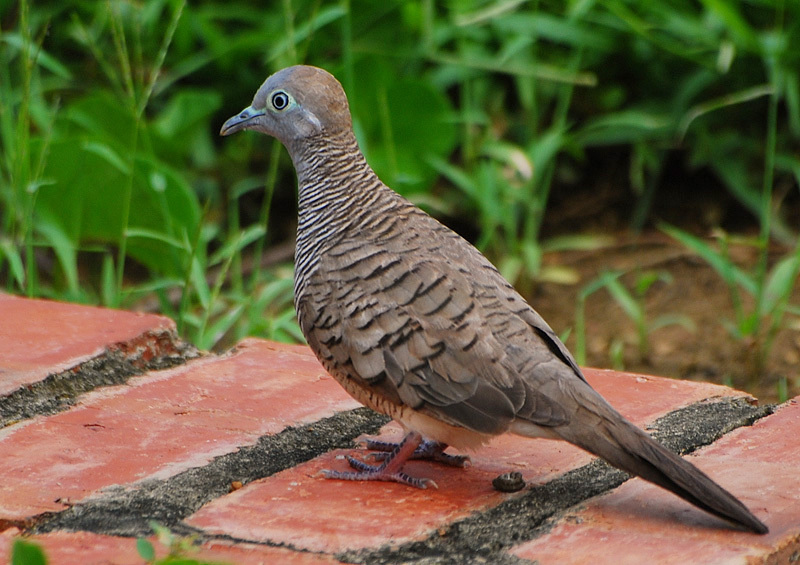 The Zebra Dove Geopelia striata, also known as Barred Ground Dove, is a bird of the dove family Columbidae, native to South-east Asia. It is closely related to the Peaceful Dove of Australia and New Guinea and the Barred Dove of eastern Indonesia. These two were classified as subspecies of the Zebra Dove until recently and the names Peaceful Dove and Barred Dove were often applied to the whole species. Thanks for viewing and have a wonderful weekend! Hello Jusni! Amazing dove, wonderful Zebra Dove. Excellent theme. Good scene and scenery, fine background. Wonderful lightness and colours. Good take. Very good sharp. High Fidelity. Fine note. Well done! A perfect sharp capture of this zebra dove adorned with perfect lighting. Perfect timing as well after the bird left 'some remains' behind it! !ha ha!! Stunning eye and great details in the beak and face features. A beauitful shot of the zebra dove captured against beauitful green natural BG with nice shallow depth while the subject is well focused and the diffused lighting makes ti more beautiful. I did not know this kind of Dove, is very beautiful and your photo is a magnificent achievement by its lush photogrametry. Hey now to the front yard Jusni , feeding on tall weed , what ? Don't you give these guys such opportunities to eat your grass by not mowing your lawn more regularly , ha ha , joking aside thank you for naming this species and the note, look at that round eye watching you , nice crop and DOF here .Oups the cute fellaw has left a little something for you to clean up afterwards !!! Excellent portrait of this nice bird, captured with very good focus and fine details of the plumage. Well composed, with the Zebra forming a nice diagonal.